Usually when somebody decides to eat healthier or wants to lose weight, salads are the main go-to food item. 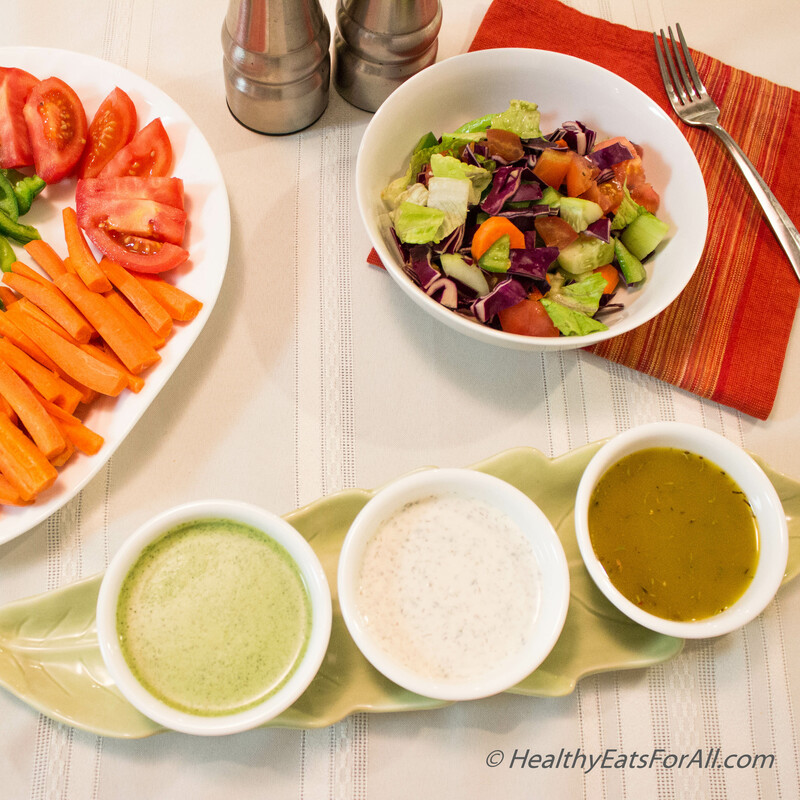 With all the best intentions we load up our plates with colorful, fresh, crunchy vegetables, but then we ruin it by drowning it in preservative-laden dressings! If you ever try to read the ingredient list on these bottles, it’s mind boggling! I can’t even pronounce some of the words. Sometimes the calorific content of the dressings is more than the salad we just ate! There is no doubt that bottled dressings are extremely convenient and I used to be just as guilty of keeping an assortment in my refrigerator 🙂 But once I made them myself a few times, I realized they barely take 5-7 minutes to prepare! Using whatever seasonings I have on hand, it’s a no-brainer. These recipes use Greek yogurt instead of the heavy fat mayonnaise and have no added sugar, additives, or preservatives. Please try these 3 recipes that are most frequently used at our house and you will ditch the chemical bottles soon! Put all the above ingredients in a bowl and whisk till everything is well incorporated. The consistency at this stage is for the dip, if you want to use it as a dressing then dilute it by adding some water or buttermilk. This will last for up to a week in the refrigerator. Put all the above ingredients in a jar/bottle/container with lid. Close the lid and shake really well. Refrigerate. Shake well before using. Should last a month or more. In case you don’t have any of the above seasonings, it’s okay to skip or reduce their quantities even. Keep in mind when you use extra virgin olive oil, it has a tendency to overpower. So if you want the dressing to be mild, use grape seed/canola oil. Put all the ingredients except the olive oil into the food processor and blend until smooth. While the food processor is going, pour the grape seed oil slowly through the top opening of the food processor. This will last for up to a week in the refrigerator. Mix well before using. This was inspired by the Trader Joe’s cilantro dressing. Works great as a salad dressing or as a dip with veggies or grilled chicken or grilled fish!